BUZZFEED HAS STRUCK an agreement with Chinese technology group Bytedance to distribute its content in China, a rare foray behind the Great Firewall of China for Western media as Beijing tightens its censorship of the internet. Bytedance, which operates the popular Toutiao aggregator, claims 200 million daily users, according to a statement the two groups released this week. Under the partnership agreement Bytedance will be able to distribute content and videos from the US online news and entertainment firm on its own platforms in China. “We look forward to meaningfully engaging Chinese audiences in our feedback loop, to learn more about what they love, how they use and interact with our content and what they’d like to see,” BuzzFeed’s international vice president Scott Lamb said in their statement. “We’re thrilled about this first foray into testing our content there,” he added. No financial details of the agreement were given. 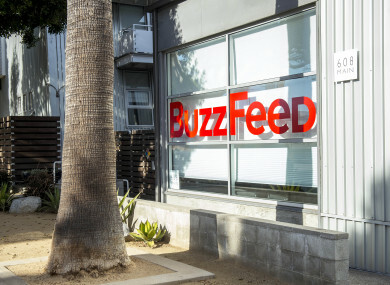 Founded in 2006, BuzzFeed has become a major player in the world of online information thanks to its viral content and its ability to generate traffic via social networks. But several major global social media networks including Facebook, Twitter and Instagram – which are crucial for delivering BuzzFeed content – are not accessible in China, where they are blocked by draconian censorship. BuzzFeed’s content ranges from in-depth surveys and potentially sensitive political topics to much lighter coverage of celebrities and the popular video recipes of its Tasty food network. But Bytedance could carefully select what it broadcasts of BuzzFeed’s content to avoid the wrath of Chinese censors. Its Toutiao platform has already fallen foul of the Cyberspace Administration of China, which in December asked it to remove sections accused of “disseminating pornographic and vulgar content” and “exerting a harmful influence”. With an online population of more than 700 million, China is a tempting market for BuzzFeed, which is going through tough times and had to give up plans for a stock market listing, after announcing in November that it was dismissing about 100 of its 1,700 employees. The Chinese audience could give it a new lease on life on the international stage, without too much financial risk. In 2016, BuzzFeed launched a Japanese edition of its website in collaboration with Yahoo Japan. Bytedance makes no secret of its international ambitions and hopes to break through abroad with a foreign version of Toutiao called TopBuzz, which relies on artificial intelligence to target information, videos and content specific to each user. Email “Buzzfeed has joined forces with a massive Beijing firm to bring its content to China ”. Feedback on “Buzzfeed has joined forces with a massive Beijing firm to bring its content to China ”.